Carl Hester grew up on the Isle of Sark, where he famously rode donkeys and carriage horses, the only type of equines on the island. His parents were not horsey, his mother was an accountant and his father was an actor. But when Carl left school at the age of 15 he was offered a job with horses and after gaining his BHS qualifications, he realised he really wanted to be a rider. The video above shows Carl Hester and Uthopia riding Kur at London 2012 Olympics. Carl Hester won the 1985 National Young Rider Championship just 18 months after taking up dressage. At 19, Carl got his lucky break when he went to ride for the German Bechtolsheimer family, and made his first British team at the age of 22. He was at the yard for three and a half years, but left to go solo after a fall-out with the family. Dressage Rider Carl Hester has won 40 national titles and has been British Grand Prix Champion five times. He has competed in three Olympics, one World Equestrian Games, four European Championships and has reached one World Cup Dressage Final. 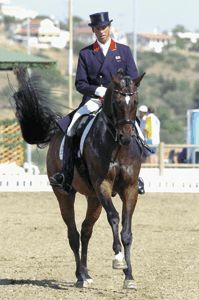 Carl’s top dressage horse was Escapado, they were the top-placed British combination at the Athens Olympics and finished sixth overall at the 2005 European Dressage Championships. Carl has had success with Escapado at National, European and Olympic level and has also owned and ridden horses such as Dolendo, Movistar, Uthopia and Valegro. In 2008 Carl was asked to ride Liebling II owned by Donald McTaggart. Carl joined the yard of Dr Bechtolsheimer, (Laura Bechtolsheimer’s father), and went to the World Championships in 1990 with Rubelit von Unkenriff, then the European Championships in 1991 and the Barcelona Olympics in 1992 with Giorgione. 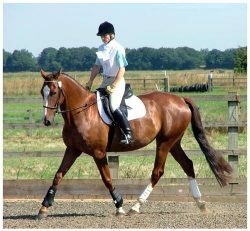 Upon leaving the Bechtolsheimer yard, Carl Hester went into partnership with Kate Carter at her yard in Stow on the Wold and then Eldersfield in Gloucestershire, until he built up his own yard in Newent, Gloucestershire. At the 2009 European Championships Carl Hester finally achieved his career ambition of winning a team medal. The team took silver and Leibling excelled himself with consistently high scores. A few weeks later, Carl Hester won his sixth National Dressage Champion title again on Leibling, which gave him 51 National titles in total. In 2010 Carl had a successful Sunshine Tour with Uthopia, who is being trained for the 2012 London Olympics. Liebling was tentatively sold to Canadian rider Cheryl Meisner who hoped to qualify for WEG. When this didn’t happen, Carl Hester was again offered the ride to help Team GB qualify for WEG. This they achieved at the Hickstead World Dressage Masters.